How does one actually measure success in the business of short track racing? Is it the amount of cars that pull into the pits? Is it the amount of fans in the stands? What about the quality of racing? For me East Carolina Motor Speedway meet all of these so-called requirements for the 2nd Annual Ronnie Barnette Memorial 200. Headlined by the true NWAAS Late Model Stock cars running 200 laps battling for a $6,000 payday heading into the off-season and the Christmas season. Let me personally say, it was a great Christmas present for us to be racing in December! 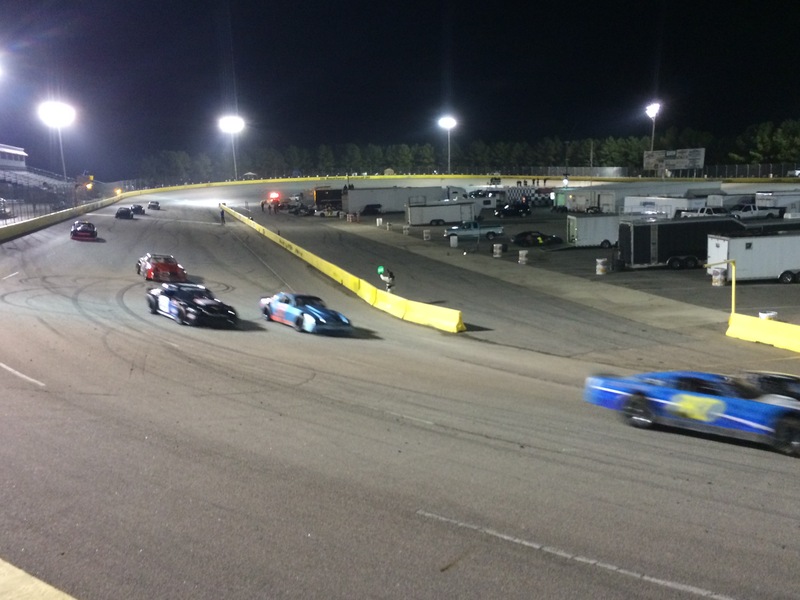 After getting rained out a month ago, eighteen Late Model Stock Car teams converged on Robersonville, North Carolina. A field stacked with talent from top to bottom; Previous Late Model champions from across Virginia and the Carolinas (Jeff Shiflettm Deac McCaskill, Matt Bowling, Louis White) – 2015 Lamborghini Blancpain Super Trofeo Series Gallardo World Champion and North American AM Champion & NASCAR Xfinity driver Brandon Gdovic – along with young, up and coming drivers like Brenden Queen and Connor Hall. Jeff Oakley & Justin Johnson earned the right to sit on the front row for the 200-lap feature. The two looked like they were the class of the field early. Jumping in front of the field early on the initial start and continuing to set a fast pace after the initial restart. Oakley led from the drop of the green flag to – what a pretty good coincidence – lap 44 when Johnson was able to mount a run turn four to take the lead. Johnson, fending off multiple cautions, a red flag period, and the lap 125 break, was able to hold off the field till lap 172 when Deac McCaskill took the lead. McCaskill surviving restarts and a GWC restart with a very hard charging Brandon Gdovic. At the end of the day a few cars rolled in the trailer beaten and battered, others happy to finish the race, and one driver $6,000 richer. Robersonville, NC – A record setting number of fans piled into the wooden bleachers this past weekend down in Robersonville, North Carolina to watch a second attempt at an Opening Night. The fans were not the only ones trying to cram their way into the high banked 3/8-mile D-shape oval, haulers were lined up from the sign in window down to the highway. Finding a spot to park your rig and unload the car at one point was turning into a team effort. Wondering where your going to park the next racecar… a problem no track wouldn’t mind having. Late Models were not the only divisions to get things “popping” in Robersonville USA – Street Stocks, Mini Stocks, UCAR, Bando’s, and the very elegant Southern Ground Pounders (SGP) were all chomping at the bit to get things kicked off for the 2015 season – SGP are a separate racing club governed by their own rules and schedule. Speaking of the SGP guys, if you are a old school, vintage car nut, then you need to track these guys down and visit one of their races! They had everything from a primer color Chevrolet Bel Air down to a Ford Pinto racing. No not some old car taken off the street, these are big engine, purpose built racecars! Ten cars were able to make the green flag, though not all ten were there at the end. Pole sitter Rodney Dye not able to make it two laps before his motor expired and sending him into the inside retraining wall. Beat the car up pretty bad but driver was able to walk away with no issues. Once the field was allowed to go back to green flag racing is was all the Jimmy Rice show – with the exception of almost going three wide in turn two & a car with no practice almost running the leader down – Rice would go on to take the victory. 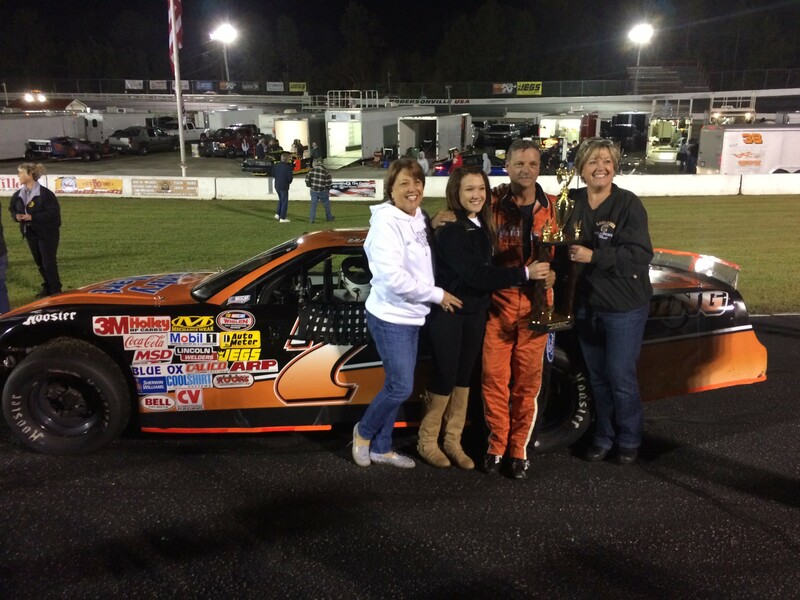 Lucama, NC – A cold night to say the least down in North Carolina to kick off the annual Thanksgiving All-Star Classic at Southern National Motorsports Park. While some were up bright and early to stand in line and fight for their right to buy the $300 TV, others were packing up race car trailers and heading to North Carolina for some racing. The ever popular Street Stock division was the highlight of the evening running a 50 lap feature. Jeff Melton set the fast time in qualifying with a time of 16.605 (86.721mph) only to be waisted 500 feet past the stripe. As the field took the green flag outside pole sitter Mike Keith must have spun the tires and immediately hooked left. Melton & Keith had a crash course with the inside retaining wall that took both cars out of contention. Mike Keith would attempt to return to the speedway but the damage was too much for the car. This would allow Ledbetter and Barnett to move up to the front row. As the green flag was displayed to the field Gary Ledbetter nailed the gas – as most race car drivers do at that time of the evening – and took off into turns one and two with Greg Barnett on his flank. These two would build a pretty large over Ganoe and Council, who spent a good amount of laps nose to tail working on each other before Council finally got around him for third spot. Things were pretty smooth sailing for the first half of the race as I would imagine some drivers were trying to save tires. Remember this was a little bit longer of a race than what some of these guys are used to. Greg Barnett was finally able to make the pass for the lead on lap 27 after hanging on to the rear bumper of Ledbetter. Just four laps later we got the nights first caution as the #10c of Chris Conner went for a solo spin in turn two.